We’ve got two of these bikes. Why? A detailed choice then purchase. A review of their ride. My intention behind buying some folding bikes was to be able to take them on holiday easily with me, as well as being able to take them out in the car when we went for a day out. I know that I can easily take my other bikes with me, but this involves having to put them on racks and then worry about them. Plus of course, if we’re out for a day sightseeing with no intention of cycling then it seems silly to go through all the hassle of taking bikes with us, and the worry as to whether they’re ok in the car-park. However, all too often we’ve been out and changed our minds, and then regretted not having bikes to go and explore properly. Therefore my sole purchase requirement was a bike that would fold up the smallest so we could hide two in the boot of a car and not worry about them. I was also constrained by cost as these were not a main bike, but a couple of “toys”. I looked at several folding bikes, even brought some home from my bike shop for the weekend, but I wasn’t happy at their folded size. This lead me to choose the Brompton. Once folded they were the smallest. Having settled on the Brompton because of its small folded size, I then had several choices from the different models. My wife (not a keen cyclist) wanted us to buy the basic C3 model as although it was the cheapest she thought it still too expensive. I wasn’t happy with this and wanted a higher spec bike. After reading the reviews, the main things that put me off the Brompton C3 was the fact that many of the components seemed to be rated badly. It appeared to me that I wouldn’t be happy with the brakes, and might suffer more maintenance expense at a later date if we rode the bikes often. Therefore I wanted to pay out more initially to get either the L series or the T series as these had the same, higher, specification; the only difference being that the T series also has lights and a rack. Having settled on the L series as the best for our needs, I decided to advertise my needs on cyclingplus.co.uk and amazingly got an answer and an offer of two T6’s plus extras at a good price. Having examined these, I found that they were only a year old, almost un-ridden but apparently unwanted. These are amazing bikes! I cannot believe how much we have used them, nor how well they ride. Instead of being spare bikes just used for holidays and days out, I ride mine to any meeting (as I can take it in rather than worry about locking it up outside), I ride it to friends if I am popping round (again, no parking worries), I use it whenever the car needs a service (to complete my journey after dropping the car off) and I use it whenever I have to take a train to work in one of my other offices (as this involves journeys to and from the stations, as well as crossing London). In fact, these bikes are used very often and definitely used whenever combining transport choices or to save cycle parking worries at my destination. I think the thing that amazes the most about the Brompton is the fact that it rides as smoothly as a normal bike. Once on it there is so little to differentiate it from any other bike, it feels stable, solid and has precise handling. I don't think I really appreciated this until I raced, and beat, a motor-cycle courier through London in the rush hour. My bike has the telescopic seat post, which I find convenient as the standard post is a little short for me (I would ride at the max seatpost height otherwise). Other than that the bikes seem to be correctly sized for each of us. The other change from standard is that our bikes have the Kevlar belted tyres which Brompton offer as an extra. I’ve got to admit that although I like these tyres because we’ve only ever had one puncture on a bad path, they do seem to lose traction in the wet, especially on greasy or muddy roads. This has lead on separate occasions for both my wife and myself to have been deposited on the ground when the bike has simply slid out from under us. These are one thing which I will be changing at some point. Although I mention the tyres as a downside here, I should point out that the bike’s handling is good enough to offset these. I have ridden my bike (contrary to the manufacturer’s instructions) off road on some very slippery surfaces. On the first time I did so, at the first bend I lost not only the back wheel as it slid out (as I am used to at that point) but the front wheel went as well. The bike was stable enough to control this sideways slide right around the bend, and then continue sliding in a general direction off down the track. The tyres may not have been gripping (I wouldn’t have expected them to) but the bike was stable and under control. The only other poor point I have come across with these bikes is that the braking performance seems to be under par. I have tried changing the brake pads, but this has not improved the braking performance up to the standard that I like. On closer examination of the bikes I feel that this is down to the fact that the front brake cable is of a relatively low quality and the outer is compressing after pressure is put on the pads. My next change to these bikes will be to buy a better quality brake cable for the front brakes to try to reduce this compression. Don’t get me wrong though, two small negatives do not ruin a bike. Some of the plus points are the dynamo lights and the rack which have come in very handy on numerous occasions. For load carrying though I would recommend getting the front pannier that Brompton provide (together with the block that attaches to the front of the frame). This is extremely stable and does not affect the handling of the bike, no matter how great the load. It also attaches and detaches very simply and quickly. I have found the pannier of sufficient capacity to take my laptop together with enough clothing and toiletries for an overnight hotel stay when I have worked from another office for a couple of days running. Another advantage of these bikes is the 6 speed gearbox. This is a simple two speed derailleur on a three speed hub. The hub is operated by a thumb shifter on the right handlebar, the derailleur is operated by a thumb shifter on the left bar. Therefore you can use just the hub as per a normal three speed bike, but instead of the large jumps that these have you are able to select an intermediate gear using the derailleur. There is also one gear which is lower than a standard 3 speed bike, and we have often found this useful on steep hills; such as riding up Cheddar Gorge. These are brilliant bikes and I would recommend them to anybody looking for a folder. My intention in buying the bikes was to be able to use them on holiday or the odd day out when we decided to explore by bike rather than car. In this aspect they have performed admirably. 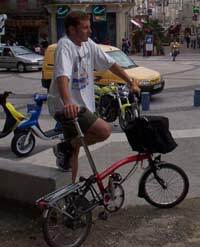 They have also proved to be extremely useful on the many occasions when I just pop out to a friend or a local meeting so grab the folding bike as the most convenient way of getting there. We have also used them on longer rides (of over fifty miles) and even ridden up some hills which surprise other people, such as Cheddar Gorge. 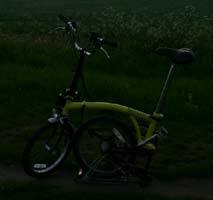 I have seen Bromptons on even longer rides (such as the Dunwich Dynamo) and heard about them on longer rides still (such as Lands End to John O’Groats).